Ceramicist Brian Giniewski captures his puppy, Jelly, alongside a handcrafted doggy dish, part of a forthcoming line of petware. Inside his studio, ceramicist Brian Giniewski places several bowls atop a table in front of a vibrant peach backdrop and scatters a handful of dog food among the clay dishes. Within seconds, Jelly, the newest member of the artist's marketing team, comes running. "She's our new hand model," Giniewski says of the 9-week-old border collie while grabbing his Canon 5D Mark III. With Jelly munching away on the pellets, Giniewski brings to life his next crowd-pleaser for Instagram, a teaser for a new line of pet ware. Giniewski, 34, is one of a handful of Philly clay throwers who've gone viral on Instagram as the platform has suddenly become a fertile marketplace for rising artists. Arguably the most successful of local Instagram potters, Giniewski over the last two years has sold work to West Elm, collaborated with Urban Outfitters, begun talks with trendy restaurants like Momofuku Milk Bar, and built a steady business of custom orders. One of his latest customers is Bravo TV Top Chef competitor Claudette Wilkins, who stumbled across his Instagram a few weeks ago. Giniewski is now providing the dessert plates for Wilkins' new restaurant in San Diego. Jelly the border collie pup often serves as a model. "Instagram has been huge for us," says Giniewski, who with his wife, Krista, manages three accounts, including one centered on Jelly, @jellyinthecity. "The vast majority of all of the business that we do originates from it," he says. "Just last week, we did a post announcing a release of new mugs on our website, and within one day, all 25 were sold." Ceramicist Brian Giniewski works on a prototype for a salad bowl in his top-floor studio in the Globe Dye Works Building. Known for producing pottery with a signature glaze of thick, richly colored drips that spill down the sides of the clay, Giniewski has built a following of more than 30,000 on his personal Instagram account (@brianginiewski). His team's third account, the playful @lil_uglies, gives pottery pieces with imperfections their own personalities. He and his wife spend several hours each day managing incoming messages on Instagram, which attracts private customers and wholesalers. "We're finding that people would much rather do their research from their sofa than travel to New York and walk through a huge trade show," Giniewski says. People find my Instagram, reach out, and start stocking their stores — it's really direct like that." Ceramicist Brian Giniewski has grown a following with his drippy pottery designs, featuring rich and thick colorful glazes. Giniewski began making what he calls "drippy" ceramics as a full-time potter two years ago, using social media from the start to spread the news about his work. "It's not just about being talented on the potter's wheel," he says. "What separates a really good artist from a really good artist who can make a living is finding that balance between fulfilling your creative visions and handling emails, calls, vendors, and all of the other aspects." Giniewski also relies on Instagram to inspire new works by showing various prototypes to his following. "There's a transparency — you put pieces out in the world, and people are virtually voting on it, enabling you to gauge what's causing excitement and momentum," he says. 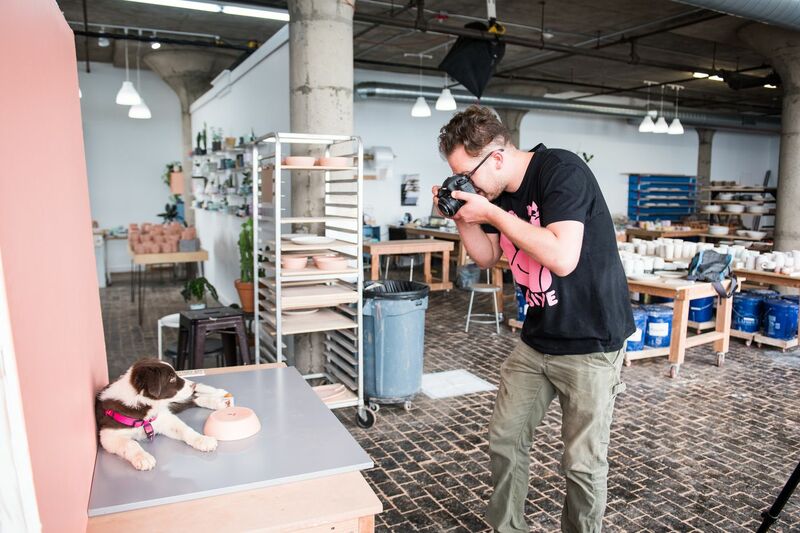 In the last two years, ceramicist Brian Giniewski has grown his part-time hobby into a thriving business, relying heavily on Instagram to attract a loyal fan base. Not surprisingly, the majority of his audience is under 35. A 2017 survey by the art marketplace Invaluable found social media is the main way nearly half of consumers ages 18-24 discover art. Nearly 56 percent in that age group said they would buy art online. Local ceramicist Michael Connelly says it’s important to showcase pottery in context so prospective buyers can envision themselves using each piece. Ceramicist Michael Connelly, who works out of Phoenixville and Brewerytown, has found that on Instagram, his personality — and even his family — can enhance his connection with buyers. "People are more likely to buy your work if they feel like they know you and can relate to you," he says. He's grown a following of nearly 8,000 on his @connellymichael account. Pictures on Connelly's Instagram show his son, Julian, enjoying simple pleasures like diving into a bowl of noodles. They also show the 45-year-old artist himself, hands covered in clay as he creates. The mix between professional and personal gives a glimpse into the life that Connelly leads beyond the teapots, vases, and bowls he sells. "Instead of just having a flat-out website where you see only the work, you get an image of the artist and how they're connected to what they're making," says Emily Marilyn Daley, 25, another local potter with a growing Instagram following. Many ceramicists are turning to Instagram not only to showcase their work but to seal the deal on sales. Daley, who describes her work as flirty and fem, launched her business in December and makes sales primarily through Etsy and social media. Her selfie-heavy Instagram, @emdceramics, is full of images of her pink and pastel-colored mugs, planters, and other handcrafted works, along with flirty-looking images of herself. "It needn't be that serious," says Daley. "I'm not a machine that just puts out work, and I don't think people are interested in that when they buy ceramics, anyway." Daley says Instagram also helps local ceramicists connect with one another. She reached out last year to Giniewski, who has since given her advice on everything from glazes to equipment to basic business tactics. "Brian's one of my good friends now," she says. "He's given me shout-outs, too, which has allowed me to gain more followers and get my work out there." As a visual platform, Giniewski sees Instagram as the ideal marketing tool for showcasing the bright, eye-catching work that has become his signature.